If I already have the Sims, Cleveland, and the Atlanta will the combat missions I receive be for the Monaghan, or the Kidd? "Collectible items may also come in daily containers after you've obtained your first collectible item." Is this encouragement to push on to that second container? Sounds like it. Kinda makes me sad i just dropped so much $ for the atlanta.. Oh well i absolutely love her so no regrets. I also have the sims. Does this mean if I get the missions for the ATL or Sims I will be rewarded in some way by doubloons or silver or do I just miss out on taking that advantage all together? That is a good Question as well. If you don't have the Cleveland is that the mission you will get. With the French BB I got the Normandie but then could not do that scenario mission for lack of the T8. Designed to get me to play more eh. oh well there is only Monaghan I don't have, so I suppose IF I am lucky the first time to get a ship, then I will get Monaghan, and if I am lucky enough to get another ships after that, I will just get silver/gold and a port-slot for it being a duplicate. I think I made note of that in another thread. This is going to be like those container missions for the T5 to T8 French BB's, and the level of unwise spending (if they go on sale) and the subsequent salt that flows are both going to be epic. 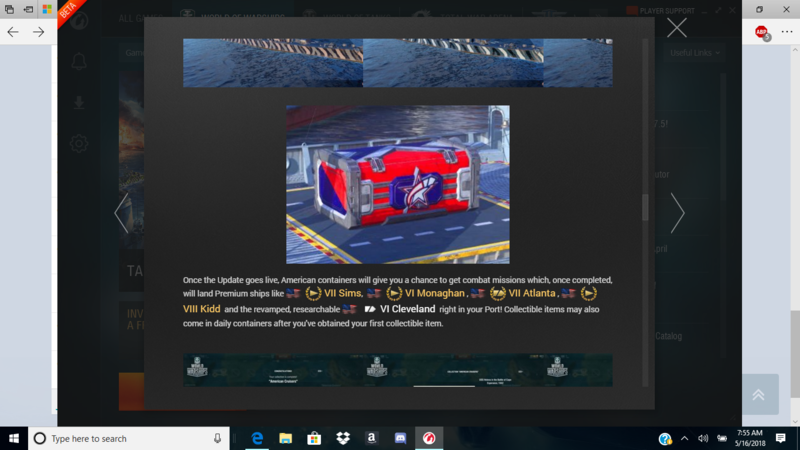 I suspect the chance to get an Atlanta (which they JUST put back on sale) is going to be quite small, in order to keep current owners happy - or at least relatively non-ragey that the ship they paid $$$ for is now winnable for nothing. I always get the Tech tree ship Missions, i.e. the Farragut, Budovny, and the Leander, but they all came with the permanent camo and their own port slot though. I didn't have any of those ships in port at the time. (if they go on sale) and the subsequent salt that flows are both going to be epic. Maybe all the salt in rank will alleviate some of that. Nope. This is not a zero-sum game - there is no limit to the reservoir of salt that can flow. Popcorn futures are looking good (and you can put salt on that too). I was just getting going on WOWs when the french stuff was going on. Towards the end I bought the 20$ pack and got all the missions. From what I read, I had really good luck. Might have had something to do with being a month behind everyone else. Towards the end I bought the 20$ pack and got all the missions. From what I read, I had really good luck. You had exceptionally good luck. There were people who spent hundreds of dollars on French crates just to try to get the Richelieu unlock... and failed (and then came here to whine about it). As for me, I got Bretagne in my very first French crate and Normandie in the last (I didn't buy any), and then I went on holidays and my opportunities to win more unlocks were over. I still to this day feel that I would have been one of the lucky ones and got at least a Lyon as well if I could have kept on going, but it's one of those things I'll never know and really don't care about. This is going to be interesting, Tier VIII, I guess I could use the Cleveland, the ARP Takao, or maybe the Alabama? Not many options there. Cleveland would be a new ship at Tier VIII, I don't have many games in the Atlanta or Alabama. Not looking fun or entertaining at this point. On the bright side, it looks like this is going to be around for a while. I suspect it will be like the Christmas crates. In those if you already have the premium ship you the RNG selects another premium ship. If you have all of them I think you get the gold equivalent and a port slot. I also think you’ll get a 10 point commander. That’s just a guess on my part. At the very least I think you’ll get a slot, 10point commander, and either the gold or silver worth of the ship. I have all those ships (except Monaghan) and would be happy with the gold, commander, and port slot. You have my condolences on that score (I got Bretagne and Normandie), but RNGesus giveth and RNGesus taketh away... so you could get lucky here where you were previously cursed on the French missions. Be an optimist! I would expect mission distribution to be the same for all players. Typically, if you buy a premium in the shop that you already have, you get the port slot, whatever extras might have come with it (x-point captain, for example) and the doubloon value of the ship. If it comes in a mission, you usually get the port slot, whatever extras might have come with it, and the credit value of the ship. I didn't buy any either. I got the 4 battleship missions right in order- 5, 6, 7, then 8 - but Richelieu was on the very, very last possible round of crates that I'd be able to get. I was rather relieved to get it, finally. I didn't partiuclarly like the idea of grinding the previous ships.